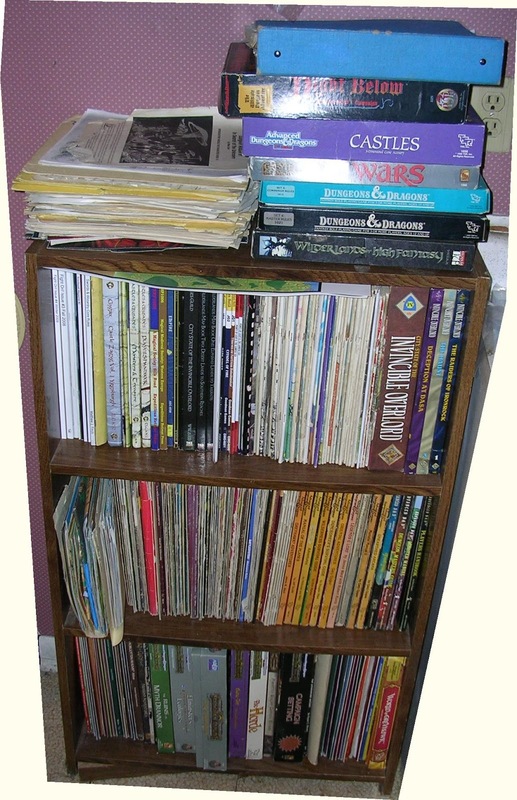 From top to bottom D&D 4e, GURPS Traveller/Mongoose Traveller/GURPS Stuff, and the bottom two all my GURPS books. My Sci-fi Modren Roleplaying stuff. Joesph over on Greyhawk Grognard has an interesting idea for an alternative setting for Metamorphosis Alpha/Gamma World. Basically take a space elevator and attach a bunch of StarLost/Silent Running style eco-domes in high orbit. I think the idea can be taken further for a variety of adventuring possibilities. You still have your domes. However beyond geosynchronous orbit lies a asteroid that is the counterweight. You several option with this asteroid. You can opt to populate it with levels creating a mega dungeon that you climb UP to. A crazy dungeon in the spirit of Barrier Peaks or Anomalous Subsurface Environment. Or you can have it essentially hollow with a hollow world environment. You can have more domes spaced along the beanstalk each with their own levels of gravity until you reach zero G at geosynchronous orbit. As for the counterweight asteroid note that the "deeper/higher" you go the heavier the gravity becomes. Something to add to the other craziness. Lots of fun can be had with Joesph's idea. From various source I learned that between Friday (Nov 23) and Tuesday (Nov 27), Lulu is offering 30% off anything site-wide by using coupon code&nbsp DELIRITAS One of the reason I post on both Lulu and RPGNow is that Lulu offers get deals like this from time to time. 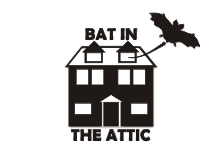 So head over to the Bat in the Attic page on Lulu and take your pick. If you are just interested in the PDFs you can pick up a MW Supplement/ Scourge Adventure combo at RPGNow for only $12. $5 off the regular combined price. Over on Lythia.com there is a couple of new releases that folks may find useful. First is Many Manors 1 a PDF of ten Manor drawing in the Harn Map Style. 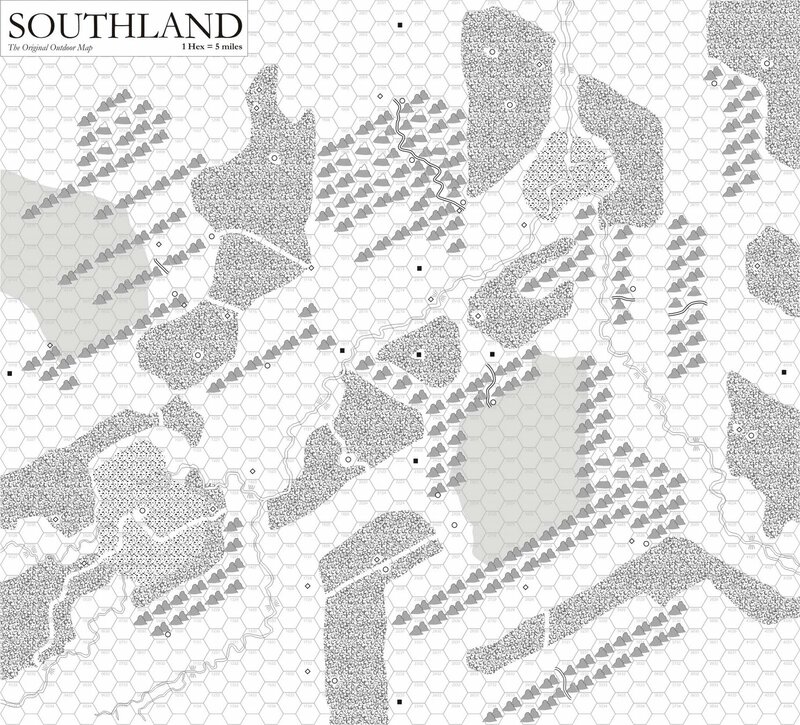 These full color maps can be customize to depict any type of village or small settlement in your campaign. Second is the Night People an article about Harnic Gypsies. 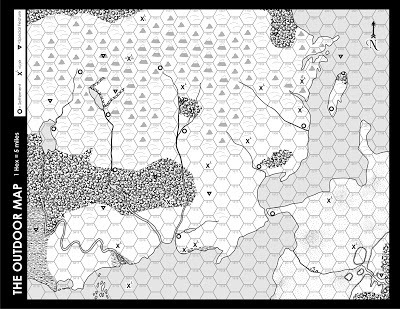 It is generic enough that it can be transplanted into any vaguely medieval campaign setting. As a bonus it has a small map of a gypsy wagon. Third is the Venarive Weather Generator, yes I have new agonies to inflict on my players. On a more serious note, the weather generation system for Harn is probably the most game friendly weather generator that emulates real world weather pattern. A problem has also been that we only every had two charts. One cool temperate for Harn and a sub polor chart for the viking land of Ivina. With Venarive Weather Generator all the other tempature/climate bands have charts. What makes it simple is that it is just twenty entries. You move up and down the chart in according to a d6 roll. With a change of 1 up, 0, 1 down, or 2 down possible. The entries are arranged in a way that mimics real world weather changes. In all an simple and elegant to generate weather. And while I mentioned this before, I can't recommend enough the Harn Pottage series or the Friends, Followers, Foes series. 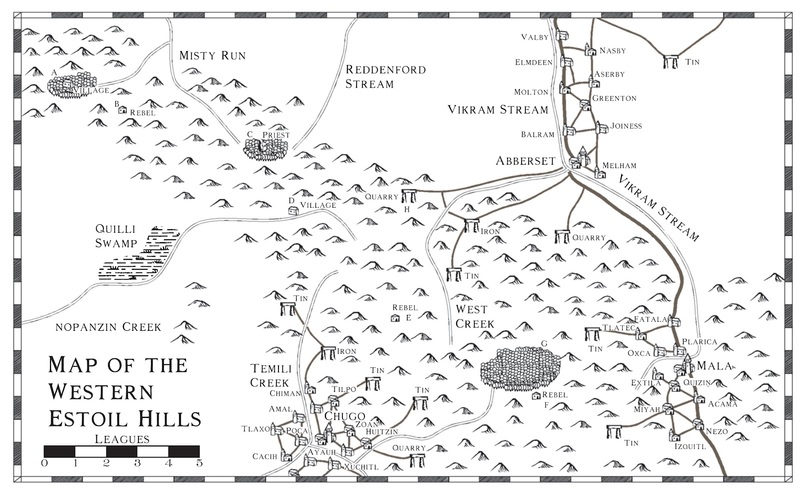 Pottage is a series of generic medieval locales and encounters while FFF has lavish illustrations and descriptions of NPCs. In D&D armor does reduce damage. It just abstracts it into a single roll. The Armor Class system resulted from the days of Miniature Wargaming. In many games of the 60s you rolled to hit and then you rolled to see if damage was done based on the armor. In Chainmail, and later D&D Arneson and Gygax collapsed that into one roll. The odds of actuall doing damage still was the same but now you reduced the number of rolls you needed to make by half. An important advantage in resolving miniature wargames. 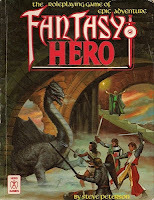 This carried over into the development of D&D. The d20 you roll doesn't represent the chance to HIT, but the chance to do DAMAGE. Better Armor is reflected by the reduced chance to do damage. However as convenient this is, nearly all the gamers I know equate a single throw of the die to a swing of their weapon. It is a natural and intuitive way of visualizing what happening on the table. So it is understandable why some gamers have a dislike for how D&D portrays combat abstractly. An attack roll is single swing of the weapon. Damage is reduced by how well armored you are. Hit Points are limited and even experienced character can be taken out by a single lucky blow. Which is why I like RPGs like Harnmaster, GURPS, and Runequest/Basic Roleplaying (although 2nd edition RQ had the limbs flying a bit to readily). The downside of my preference is that combat takes longer to resolve than D&D. In my experience about twice as long for well designed system like Harnmaster, and GURPS. So D&D has it virtues which I appreciate when running a campaign. 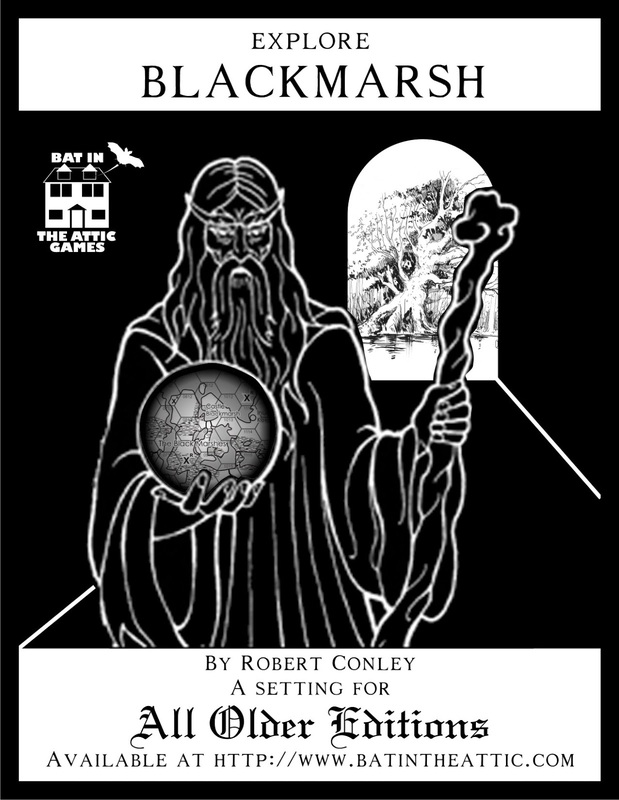 Both Blackmarsh and my Majestic Item Creation Rules have been added to the Swords and Wizardry Reference site. Thanks to John Reyst for his hard work. 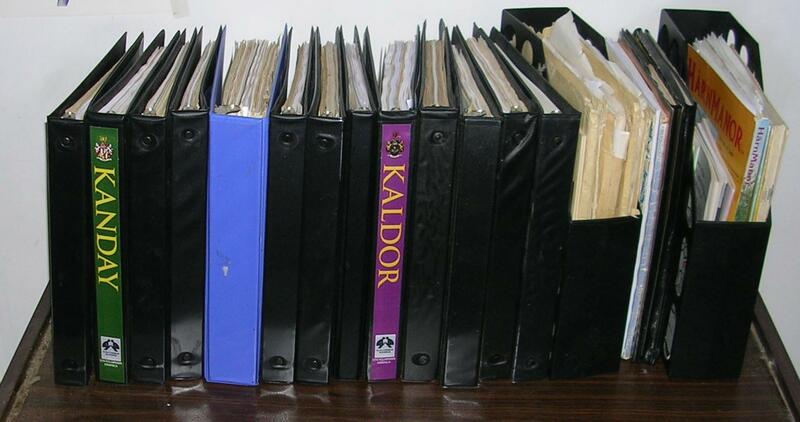 Like the site for the d20 system reference and the Pathfinder system reference. 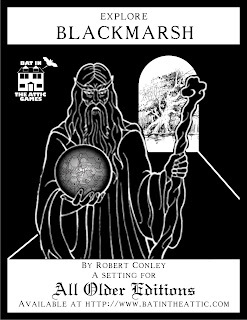 There is now a site for the Swords and Wizardry System Reference. How much do Gems weigh? I would call it at a 100 gems per pound unless you specifically state it is a certain size (like the eyes of the Player Handbook Idol). Gems are weighed in carats and the problem is that the value per carat varies between gem types. Harnmaster is the only Fantasy RPG I know of that gives that information. Even armed with such information I feel it strays over the line of too realistic of a rule. Harnmaster rates each gem type with a price factor and then multiplies it by the weight in carats squared. Note that a carat is 2 grams. 227 carats in a pound (I rounded up). A 100 per pound is a nice average that reflect gem's compact value at a somewhat accurate weight without having to go through a lot of bookkeeping. For those 1,000 gp, 5,000 gp gems just make up a weight from 1/4 to 1 pound. 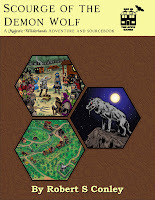 For those of you who don't own the Majestic Wilderlands I also have a special $12 PDF only bundle of both the Majestic Wilderlands and the Scourge of the Demon Wolf. 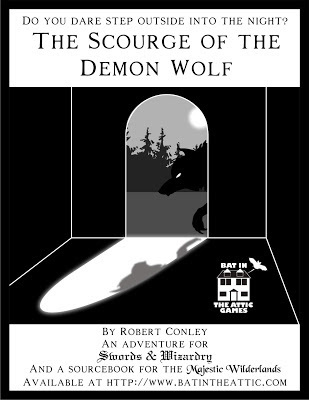 For those who already bought the Scourge of the Demon Wolf PDF on RPGNow I have created a special $5 price for you to buy the print copy. 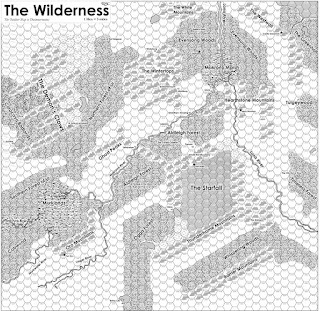 As with Majestic Wilderlands I always intended the PDF to be free with the purchase of the Print Version. For those who prefer to take your business on Lulu, the coupon code NOVBOOKS12 can be used to get 20% off the PDF or Print. Unfortunately Lulu doesn't have the tools to allow the PDF to be free with the purchase of the print edition. This combined with the e23 supplements is by far the most useful gaming supplement on pre-industrial life. Since with these types of books GURPS is focused on realistic emulation the few mechanics can be easily translated. The length is not due to in-depth exploration of any one topic but rather due to is comprehensive sweep of pre-industrial technology and society. The hardback is focused on technology and the three e23 release on pre-industrial society and life And it has a extensive bibiliography. The downside is that the mechanics are in my opinion too abstract even for GURPS and really a toolkit for the referee to come up his own figures. And it is oriented to a single RPG. For the d20 world this is one of the best supplement. It is comprehensive and well written. The downside is that the mechanics are just OK, and it is a bit wordy. I also recommend its companion A Silk Road which discuss medieval trade focusing on long distance trade. It include material I haven't seen written anywhere else for Roleplaying Games. A good solid writeup of medieval life on the manor and in the town. A bit pricey but if you like reading the writing style of the preview, this will be a useful purchase. The Harn Campaign setting is organized into a series of articles some of them on Medieval life and not specific to Harn at all. The downside they are pricey, upside is that what game mechanic are straight forward and easy to use with other RPGs and they are concise. It hits a sweet spot in terms of emulating manorial life, in the way that Classic Traveller hits a sweet spot in starship construction and interstellar trade. Yes it involves some math and a spreadsheet but it all straight forward. But what makes it shine is how it generate the yearly issues that the manorial lord has to deal with. Basically each tenant household rolls on a chart and some of the results can lead to adventures or complex resolutions for the lord. And if you can find it Harn's Pilot Almanac has stellar Ship Construction rules and a straight forward medieval trading system. Again we are talking Classic Traveller simplicity. Ars Magica, a Medieval Handbook. This is similar to Lisa Steele's Fief and Town, it is a more comprehensive and a lot cheaper, but devoid for the most part of Game mechanics. These represent the what I consider the best and most useful summaries of Medieval life for gaming. I own all of these (and others) and used many of them in my Majestic Wilderlands campaign. I found that NOVBOOKS12 works for a 20% discount off of your lulu purchase. So if you missed the October discount you are not too late to order Scourge of the Demon Wolf, Majestic Wilderlands, or other fine OSR products from Lulu at a discount. As much of a fan of GURPS as I am, I do realize GURPS has a certain... well... reputation for complexity. And it is undeserved. That not to say that GURPS doesn't have a hurdle to overcome but complexity doesn't have to be one of them. 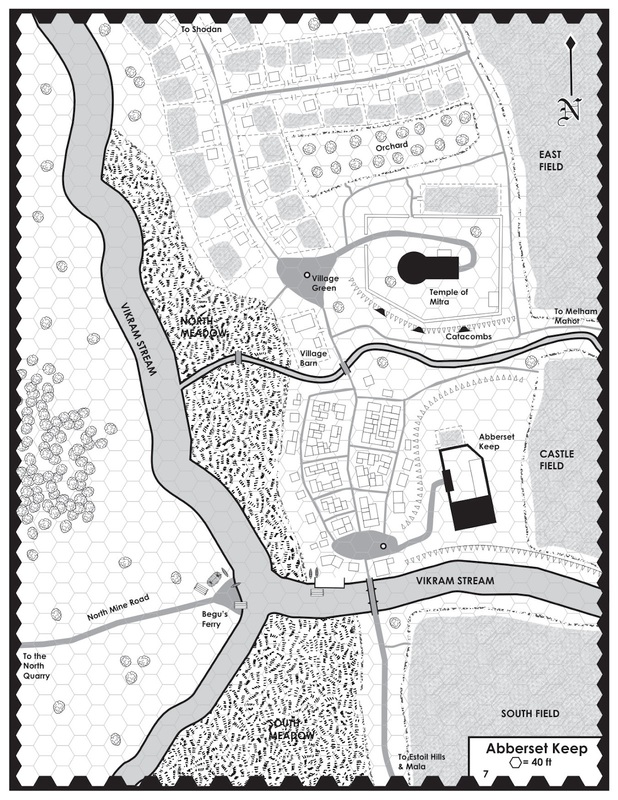 The heart of GURPS is found in the free GURPS Lite PDF. It 32 pages and every rule in there is used in a normal GURPS Campaign. The devil for GURPS is in the details, literally. GURPS has a LOT of details. Coupled with that is the fact the GURPS core rulebook are a toolkit. Note if you want to get a taste of the Magic System look at the GURPS Lite 3rd Edition. And if you don't read English well, take your pick of the language of your choice. 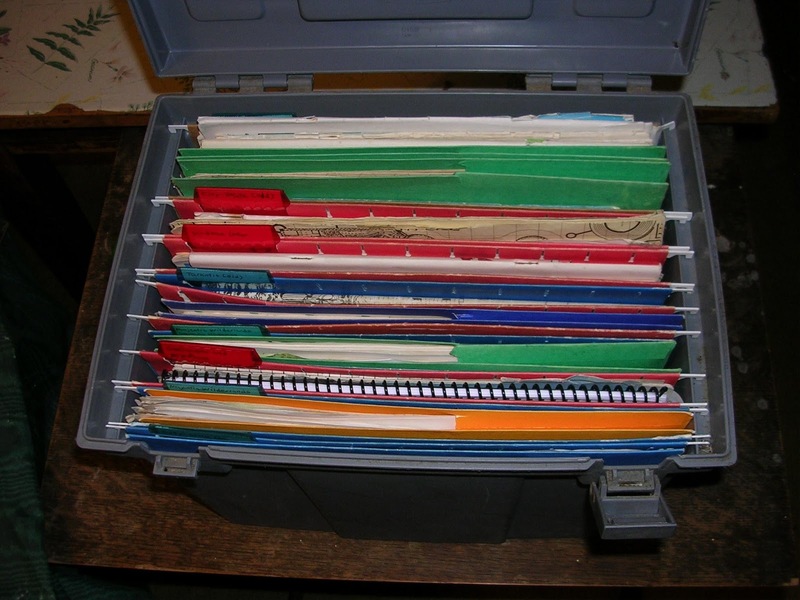 To use GURPS you need to choose which options you are going to use to run your campaign. Most of the options are not particularly complex but SJ Games takes the Generic in GURPS very seriously and GURPS 4th edition is a system that literally can handle any type of genre. However the toolkit aspect doesn't appeal to everybody and therein is why GURPS has the reputation it does. What SJ Games has done in recent years to mitigate this is through their e23 store offer PDFs that IMPLEMENT GURPS for various popular genres. The Dungeon Fantasy series implements GURPS for dungeon crawling. Monster Hunters allows you to play Buffy/Supernatural/Angel/Fringe style campaigns.There is a bunch of them. Dungeon Fantasy 1,2, and 3. Beyond this you can pick up GURPS Banestorm not so much for its Yrth setting but for all the templates, creature, and character info. GURPS Thaumatology gives you more variant for Magic, some unique some building on GURPS Magic. If you like detailed combat, then look no further than GURPS Martial Arts. GURPS Low Tech has the low down on all the mundane stuff of the medieval world. The follow-on PDFs gets into social and cultural details. 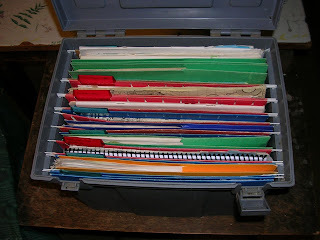 Not even you don't want to use GURPS, Low Tech is a great summary of pre-industrial technology. 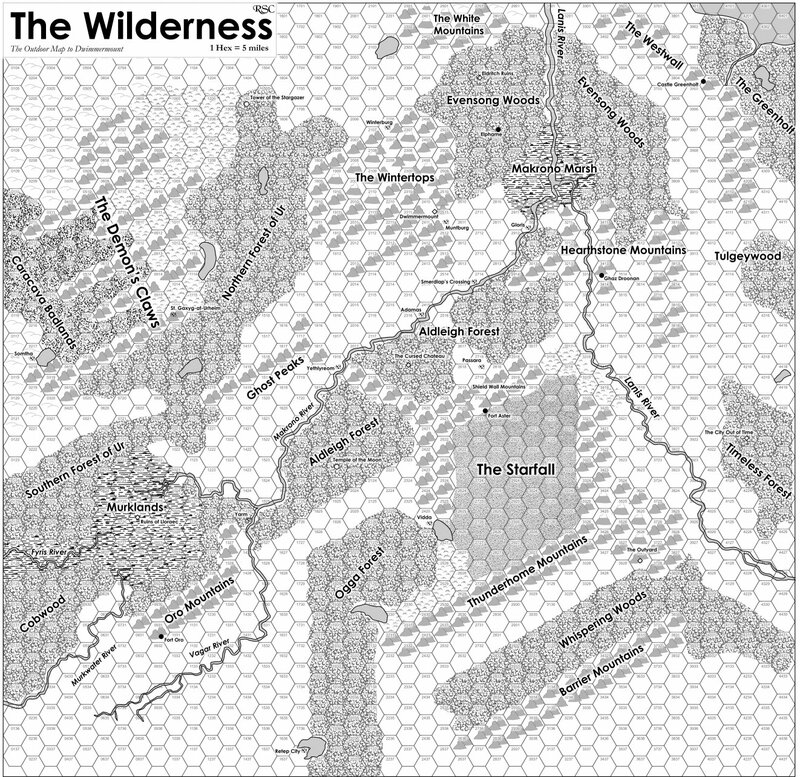 Here are several example from my Majestic Wilderlands that may inspire you for your own campaigns. This started out as an alliance of clans of the Tharian Horselords. The clanheads, later their representives, came together as a senate to elect an Overlord to lead them in battle and adjudicate dispute between the clans. After the successful conquest of City-State and neighboring lands, they admitted some of the conquered territories as full members, their nobility allowed to sit on the senate and elect the Overlord. In the century of its existance the Overlords have engaged in additional conquest, mostly at their own expense, that elevated the office from one of first among equals to a true ruler of the confederation. A bureaucracy has grown from what was the Overlord's household staff. Today the power of Overlord is only matched if all the member of the confederation unite. Also the whole of Tharian culture is fraying as the mores of customs of the horselords are not up to task to ruling many of the sophiscated cultures they conquered. Adoption of foreign cults and following charismatic leaders is the order of the day in the campaign's present. The Viridistan Empire was founded by a race of humanoid demons who managed to escape the Abyss. There has been three Viridstan Empires. The Third Empire was founded when the number of Viridians were declining. They are noted for their perscuetion of all other religion subsituting the Imperial Cult which elevates the current Emperor to godhood. They believe greately in divide and conquer. The Empire is divided into provinces. Provinces are divided into districts. Each province and district has a Governor in charge of civil matters and a General in charge of military matters. Viridistan custom and law is very strict on the separation of military and civil authority. At the district level there are Magistrates and Sheriffs. There also a district Senate which makes local laws and control local taxation. The senators are appointed by the Emperor on advice of the Governors and Magistrates. 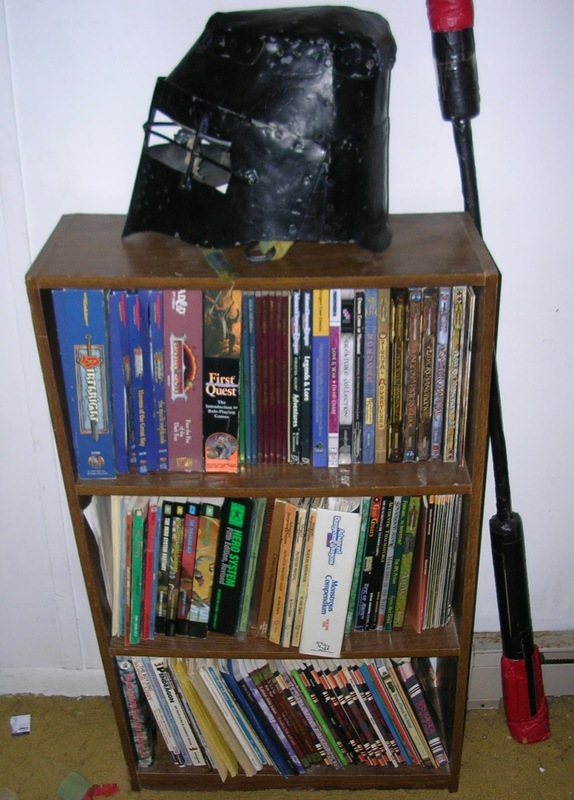 There are several empire wide organization under the sponsorship and protection of the Emperor. The Imperial Cult is one of them as well as the College of Artificers (focused on making magic items). The various Ghinorian successor states have the closest thing to traditional feudalism in my setting. The Ghinorians believe themselve to be the chosen people of Mitra, the Goddess of Honor and Justice. Their earliest governments were theocratic. While this no longer true of present day realms, The Church of Mitra is still highly important in Ghinorian culture. By tradition the highest Ghinorian title is the Prince. Their equivalent of King is reserved for the rulers of first state that managed to unite the Ghinor several thousand years ago. Since it fall, rulers of subsquent Ghinorian realms have decline to assume the title out of respect. During the Ghinorian Empire the head of state was known as the Imperial Prince and was considered the Prince of Princes. Beneath the princes are dukes, counts, and barons. Like in Earth's history, Dukes and Counts were originally imperial offices that were transformed into higher noble offices after the collapse of the Ghinorian Empire. The titles of Prince and Baron were holdovers from the earliest days of Ghinorian cultures. The collapse of the Empire also caused the imperial economy to collaspe along with the widespread use of money. Land grants became the only means which the successor states could raise and maintain troops for their defense. However despite the bleak economic times, serfdom never took hold. The Church of Mitra was firmly against anything that smelled of slavery or involuntary servitude. Instead sharecropping became the norm for feudal lords dealing with landless peasants. Manoralism did take hold as peasants needed to pool their mergre resources as well as the protection of the feudal lords. In the last two centuries before the campaign's present the money economy has re-estabilshed itself and many peasants have managed to purchase the strips of land they work. Also the various successor Princes are working to separate civil authority away from the feudal lords. This has led to violent clashes in some regions. Also the Ghinorians are divided over how catholic their faith in Mitra is. One side preaches that any who accepts Mitra as their god is a Ghinorian with all rights and oligations. 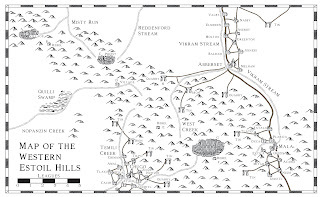 The other side believes that only those who are born Ghinorians are the chosen of Mitra. Like the Tharian Horselords the Elessarians are a clan based society. However while the Tharian clans are large groups of extended families, Elessarian clans are confined to immediate relatives. Elessarians have kings and nobles, however they serve mostly only as military officers. The source of Elessarian law are the Trehaens, a groups of scholars. Many Trehaens pursue the study of law and act as judges and mediators in disputes between clans and individuals. If need be they can issue a writ to the local nobles calling on them to enforce a judgment. Decisions o a individual Trehaen can be appeal to a regional circle. From there a final appeal can be made to the King's Circle of Trehaens. The king is an adminstrator and the supreme military commander. He has a lot of respect but little power except in times of war or emergencies. Elessarian culture is highly influenced by the Elves, and out of all the various Wilderlands cultures they are the most apt to cooperate and interact with the traditional demi-human races (elves, dwaves, halflings, etc). Tenkar has a post about definitions which go me thinking about my feeling on the matter. In general I like to focus on describing what going on and develop terms to describe what I see. For example when I look at folks who say they are part of the OSR the only common element I see is that they play an older edition of D&D and don't think it broken or outdated. Everything depends on where you are looking. 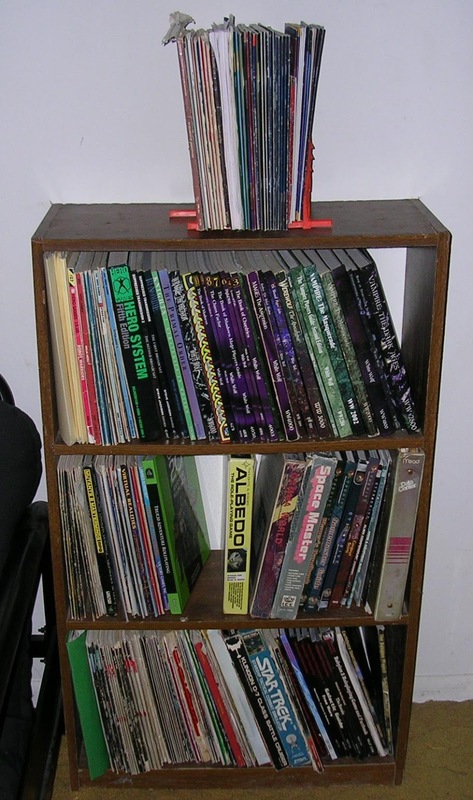 Which is why I say the OSR is comprised of fans of older editions of D&D. But some folks launch into a debate with me and say "Well, what about Traveller, Tunnels and Trolls, etc, etc. They are old school too." 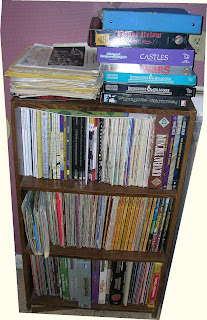 To which I say yes they are old school, but the OSR is foremost about playing older editions of D&D . However depending on who you talk too. You will find interest in all those games and more. The fact that the group of gamers who like playing and publishing for older edition D&D got labeled as the Old School Renaissance is one of those accidents of history. What can I do different with the game that was not tried back in the day because of circumstances or the interest of folks back then. If are you not doing this don't sweat it. 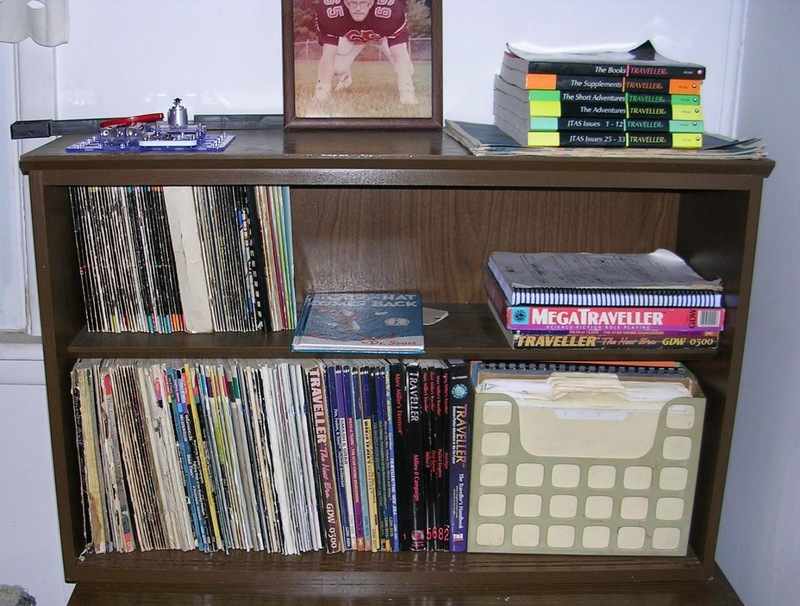 Because first and foremost the ultimate goal of what we are doing is taking these dusty old games off of the shelves and start playing them again to the enjoyment of a new generation. 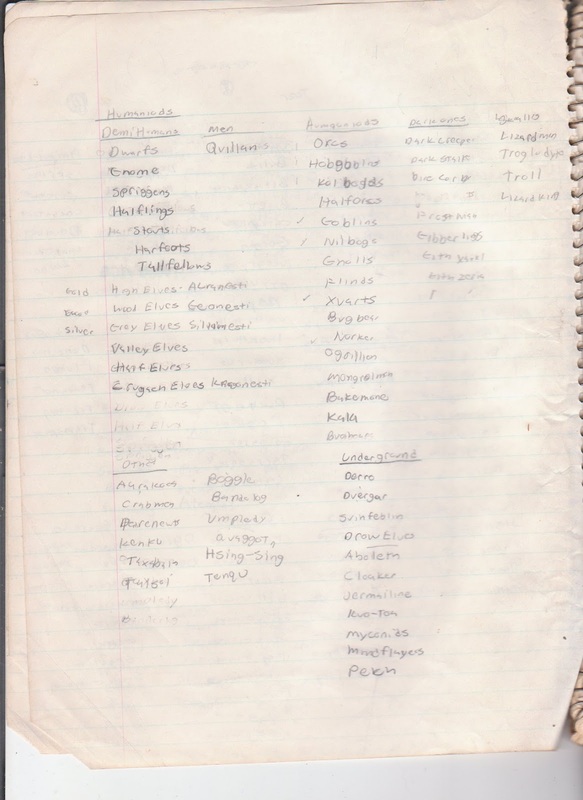 From the Attic: Where are all the humans in Greyhawk? 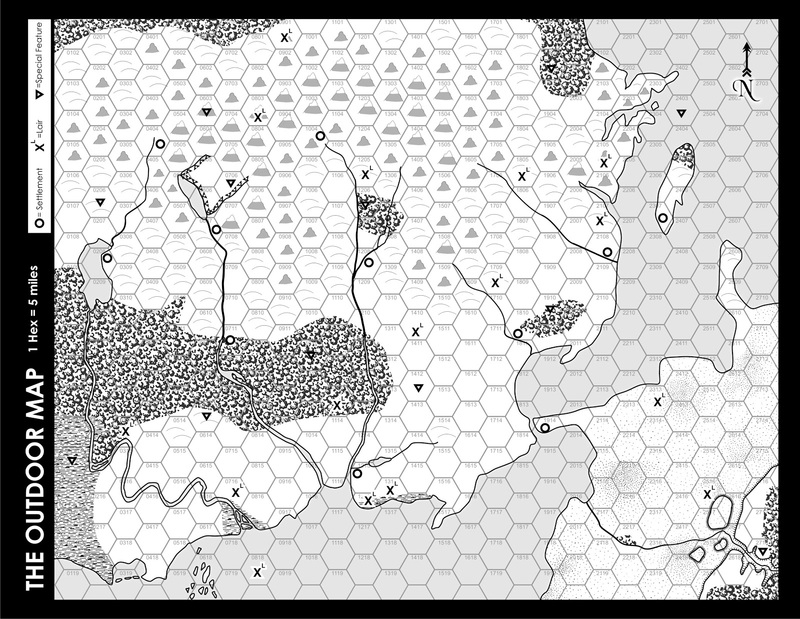 Over on Hill Cantons, ckutalik writes an interesting post on the very low population density of the World of Greyhawk. 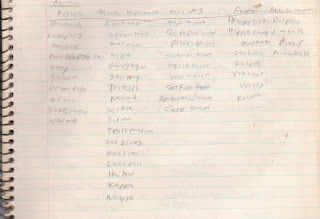 To which I added that well it because there are many creatures that are sentient and capable of forming cultures. In fact over a 100. And therein lies a table. 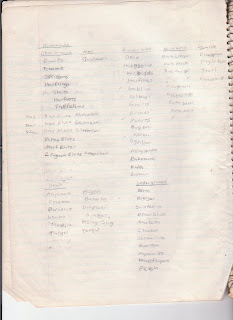 For some reason back in the day I decided to categorize all the monsters in the Monster Manual, Fiend Folio, and Monster Manual II. I have a small blue 3 subject notebook filled with my lists. It is because of this project I know pretty much the number of sentient culture forming races in AD&D 1st. 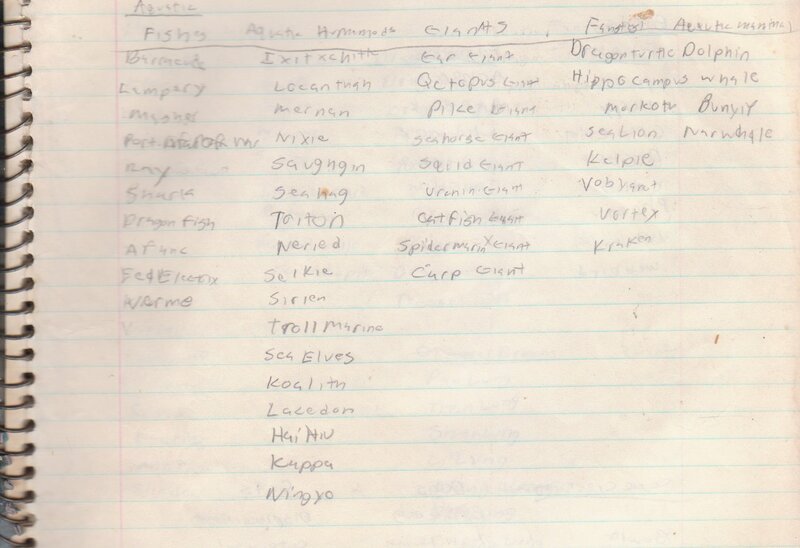 I will eventually post the complete transcribed notebook but here are the two pages with the sentient races plus the scans of the original.